Can Cruise Travel have an Edge? Celebrity Cruises Thinks So. We don't normally go gaga over ships that haven't launched yet… But this news we just had to share with you. 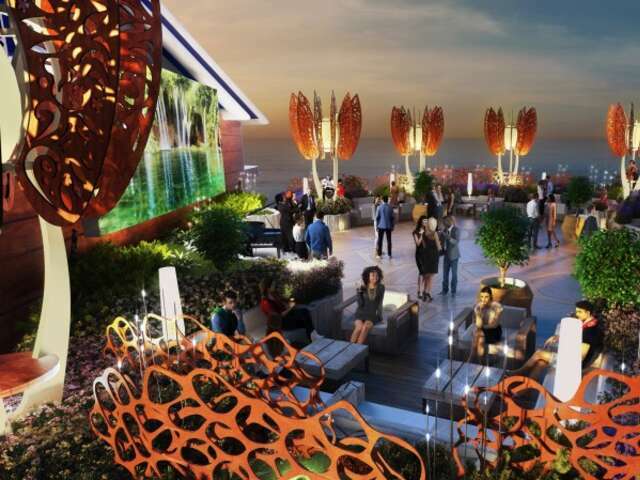 At a cruise industry event last week, Celebrity Cruises announced the first of a new class of ship: The Edge. The first ship designed entirely in 3-D, in (parent company) Royal Caribbean's Miami Innovation Lab in the world's largest and highest resolution 3-D virtual reality simulator in the world, we think the billion (with a 'b') dollar Edge earns its name. Imagine this: designers were chosen for their inexperience – inexperience! - with cruise ships and cruising. Celebrity wanted a truly fresh approach to how to enjoy life at sea. No preconceived notions, and nothing was off the table. 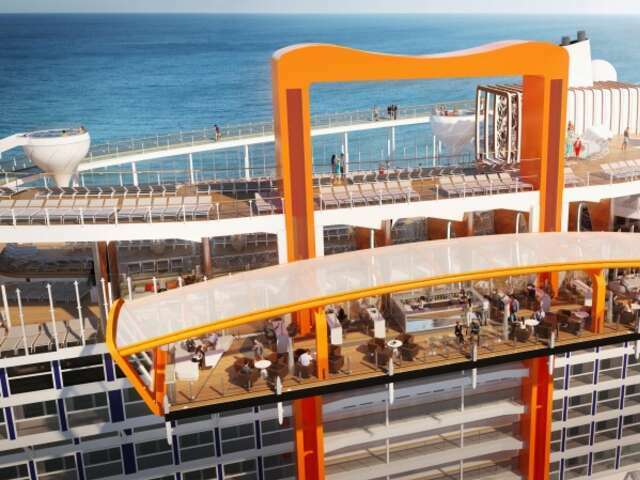 New-to-cruise travelers, this could be the ship for you! 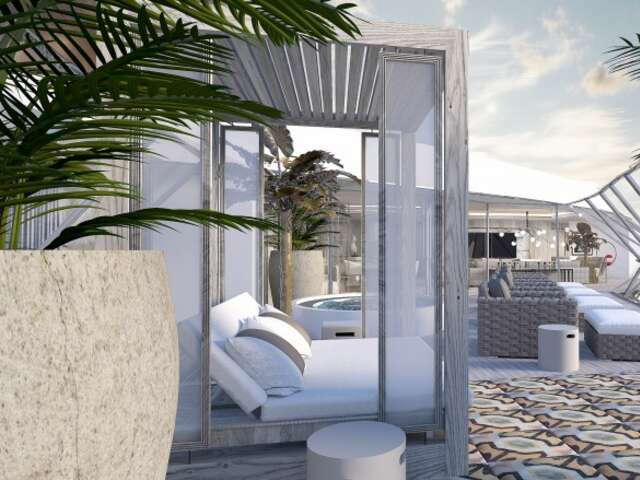 Highlights of their revolutionary approach include outward-facing design, a big break from traditional inward-facing design, connecting guests more to the seascape around you and practical, make-life-easy digital innovations – not just gimmicks. Originally conceived as a tender (small boat to shore) launch but evolved into an engineering feat that is so much more: the world's first cantilevered venue at sea that travels up and down 13 stories on the side of the ship, transforming into different venues on different decks: an al fresco specialty restaurant under the stars, an expansion of the pool deck, a luxury embarkation station. The Resort Deck, encompassed by an outward-facing, untraditionally asymmetrical terraced pool deck nearly 22 feet high that makes the ocean views and landscapes the focal point while lounging poolside. Spectacular martini glass-shaped hot tubs suspended elegantly in the air on the slenderest glass stems and bookend the pool. A larger-than-life artistic mirror installation – an ever-changing, abstract piece positioned above the Pool Bar. 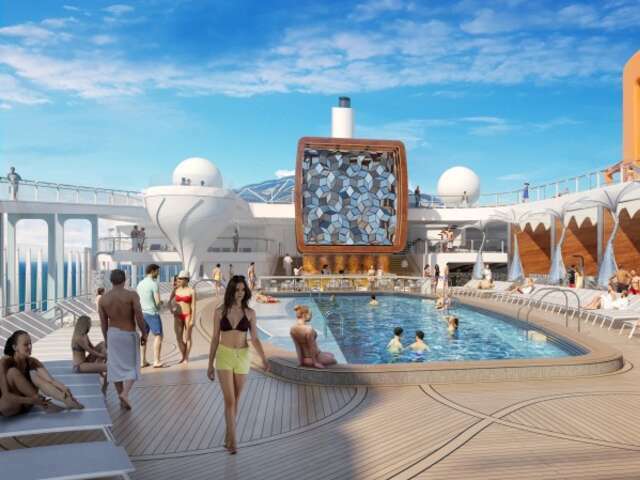 The pool deck's oversized sculptural pieces unlike anything we've seen at sea. Dramatic, unique tree sculptures add an air of whimsy and create an intimate setting at night when lit up. The Rooftop Garden, a living, urban playscape designed to awaken the inner-child in everyone, tended to daily by a resident horticulturist, an interactive space, including pop-up live music performances from musicians in the treetop sculptures. 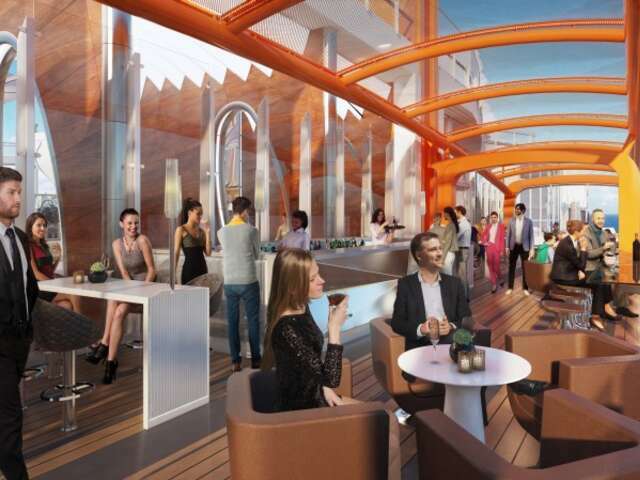 The Retreat Sundeck rivaling any high-end resort, with over-water hanging chairs while the water laps beneath your feet or you lay back in the shaded resort-style cabanas and soak up the nearly 240-degree panoramic views on the forward end of the ship. The Retreat Lounge, located just below The Retreat Sundeck and open around the clock, touching the sea on both the port- and starboard sides, and offering seemingly endless ocean views. Edge staterooms with Infinite Verandas, revolutionizing the standard veranda stateroom with the touch of a button, blurring – even erasing – the boundaries between inside and outside. 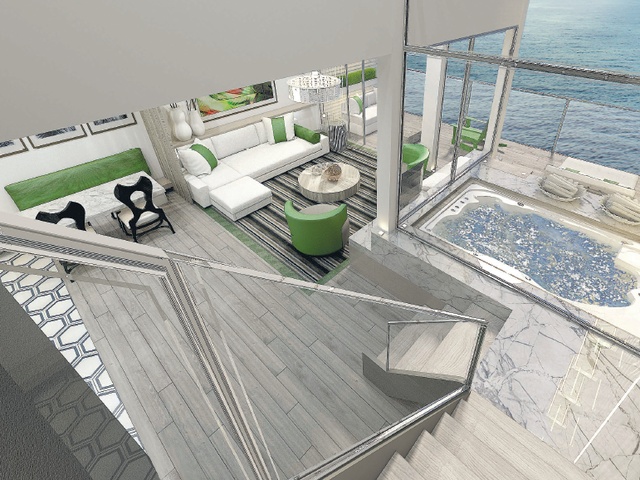 The entire living space becomes the veranda, letting you walk right out to the water’s edge. 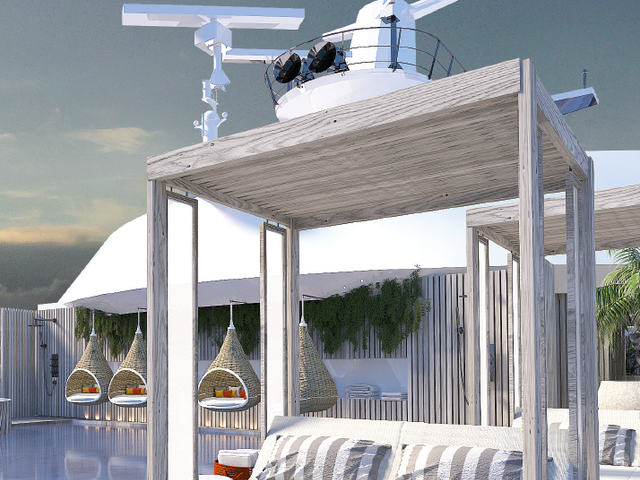 Altogether: a uniquely nautical interpretation of a stand-out, stylish, boutique resort… that happens to deliver you to a new port of call every day. 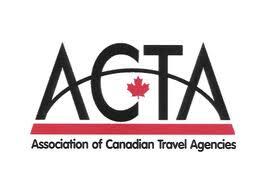 'Frictionless arrival', eliminating the stop-and-go check-in process that frustrates modern travelers, replacing it with a seamless experience harnessing facial recognition software and a system of geofenced beacons. The cruise industry's first–keyless entry using a smart phone. Another cruise-first: stateroom automation allowing guests to precisely adjust lighting, window shades, temperature, and service with a simple touchscreen. Virtual Concierge app harnesses Artificial Intelligence, allowing guests to order drinks, book dinner reservations, or reserve shore excursions. Way-Finding using smart phones with sensors. 'X-Ray Vision' (actually, a system of HD cameras) allowing you to peek behind walls and closed doors of selected locales, like the bridge, the engine room, or even the anchor. We can't wait to see the Edge come to life. You won't be able to sail on this ground (wave? )-breaking new ship until December 2018, but you can already reserve your place so you can be among the first to see if you agree: there's real Edge to this new ship.